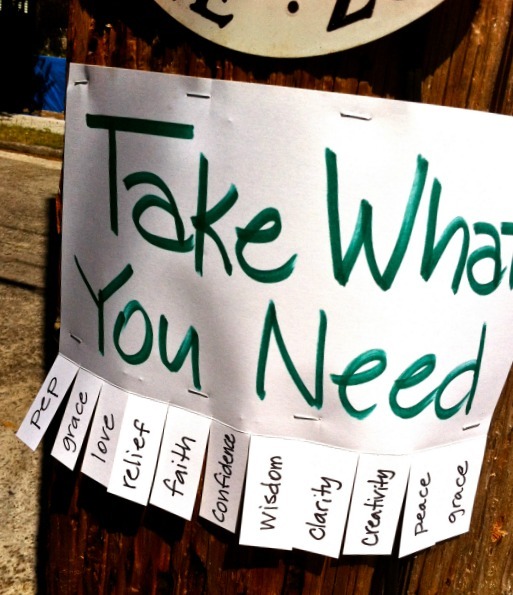 TAKE WHAT YOU NEED. I loved seeing this flyer posted a few blocks from my house. It reads: Take What You Need, and offers the reader a some thoughtful choices ranging from Pep, faith, clarity and grace. I think I'm going to be taking some time off. But it's no vacation- actually I'm overwhelmed with a lot of work, and can't manage all my pokers in the fire so to speak. I normally take a Blog-cation in August, but this year it starts a little early. I'll probably post a few things in the coming weeks, but for the moment the blog-life needs to take a breather, so I can focus better on the business side of things. I can't even spare a few extra minutes to spell-check- so my apologies in advance for any typos. PS: Don't forget I'll be busy listing new items for my online shops! For my best curated vintage be sure to swing-by Etsy, and for swanky pre-loved and bargains, you'll find some great buys on eBay. Hope your time off is super productive! My dear friend, take care of your business and of yourself! Be happy, productive and have fun and I'm be back around when you come back. Don't worry about us - we'll just entertain ourselves, and maybe mow your lawn while you're away. You'd better lock the liquor cabinet thought! Hey I've seen this flyer around our neighborhood too. It's great. I probably need a few of these. Well, enjoy your time off. Can't wait to see you back though. I'll take some wisdom with added pep please. Take what you need, and have a really good break Bella, hopefully with lots of play as well as work. I'll take some clarity, please. We all need to take the time for what we need. I hope your break allows you to get caught up with the things that matter, and provides inspiration and energy. Will miss you Dear Bella. Sending you love from the available thoughtful choices. And I'll take a little peace and send some of that your way too. Take care of your precious self! I'll miss you but hope you have a restful and productive blog-break!! wish you lots of fun and lots of successful business! love that flyer you've find on your way!, you have witty neighbors! Good on you for taking a break, getting priorities sorted! Yeah for time off! I need some too:) just wanted to make sure you got my email KMK interview not sure if your still interested in that. Enjoy the time off. Oh, I adore that idea for a flyer. May your catch-cation be productive and refreshing. We'll see you on the flip side. Happy blogcation Bella! I'm feeling much better after mine. Definitely got some clarity too. Thank you so much for the support and kind words on my blog too.